Home » Food » Food Review: Teochew Traditional Seafood Steamboat at Joo Chiat | Worthy Alternative to Beauty in The Pot and HaiDiLao Hot Pot? The Place Surprised to find this steamboat place, lurking just few streets down from my favourite steamboat restaurant in town, Beauty in The Pot at Kinex Mall. Teochew Traditional Seafood Steamboat at Joo Chiat Road is strongly recommended by one of Panda’s brother, and it is definitely worth a visit. Despite an unpretentious store front, the walls of the restaurant are lined with photos of the owner and various local and foreign celebrities, and the caption <不好吃不收钱> hanging at the entrance. Needless to say, our expectations were raised. The Food There’s no need to argue or fret over which soup broth to pick, as there’s only the TTSR Special Soup Base (S$10 for 2 to 4 pax, S$15 for 5 to 8 pax) to choose from. Taking more than 5 hours to prepare the soup base, the restaurant uses both shark bones and cartilage; yes, imagine the collagen rich soup! While at Teochew Traditional Seafood Steamboat, you have to order some of their specialities. Go for both the Pork Dumpling (S$7) and the Fish Kuey Tiao (S$7). The Pork Dumpling is actually ‘herh keow’, aka fish dumpling. The skin is made from fish meats, and then wrapped with minced pork fillings. And as you might have guessed it, the Fish Kuey Tiao is made with fish meats too! Interesting texture, and perhaps the only few restaurants in Singapore which does it this way. Another favourite is the Fried Dou Gen (S$5) here, comprising of thick multi-layers of beancurd skin. The crispy deep-fried outer layer contrast very well with the soft and chewy texture inside. It is good to even have it on its own as served, without dipping it into the hotpot. Another recommended item is the Brinjal with Pork Floss (S$15). At Teochew Traditional Seafood Steamboat, you can get to enjoy zichar dishes together with the steamboat, and this fried brinjal with pork floss is so addictive. The crispy eggplant texture, coupled with the fragrant pork floss, I am certain there will not be a paiseh piece left. Of course, expect the other usual suspects for a steamboat meal. Fresh ingredients and all priced reasonably, including the USA Prime Beef (S$12), Pork Belly (S$9) and the other freshly made fish paste. Rants During lunch service, some of their popular items were not available during our visit, including the popular homemade Fish Ball (S$6) and Chef’s Recipe Meat Ball (S$7), as the kitchen was still prepping them, and would only be available for dinner service. Will I Return Again? A resounding yes. 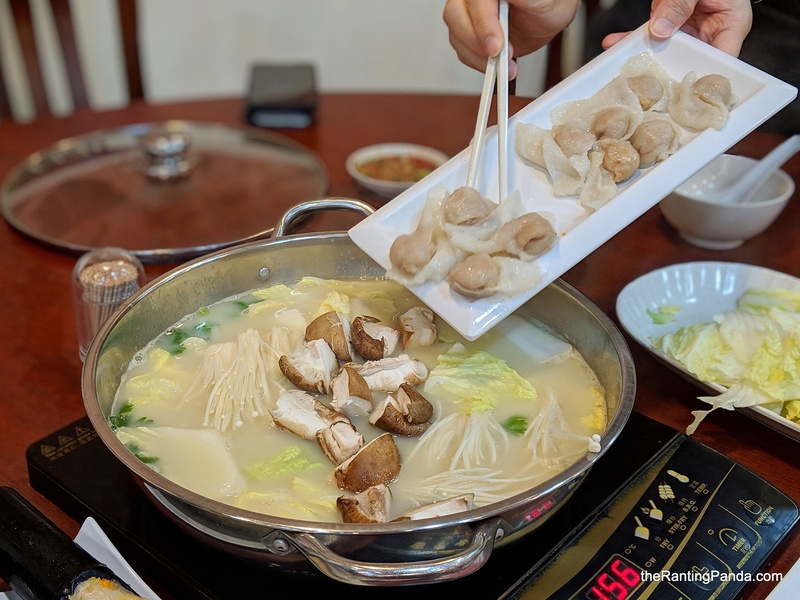 The service was good, with the attentive staff refilling the soup generously; and the food items are good for both steamboat and cooked selections. I am looking forward to heading down again to try the other items on the menu. And no, don’t ask me which is better, Beauty in The Pot or this, it is truly a tough fight for now.